I’m so grateful for this book. I received Ordinary Grace as a Christmas gift, and I’ll admit that I was skeptical to read it at first. It’s been a REALLY long time since I’ve read a book that rocked my world, and I didn’t want to waste any more time reading something that I would abandon midway. Ordinary Grace, written by William Kent Krueger, is set in New Bremen, Minnesota in the Summer of 1961. For 13 year-old Frank Drum, the son of a Methodist minister, it’s a summer filled with lies, secrets, and death. When tragedy hits home Frank is thrown from the innocence of youth into an adult world he needs to somehow navigate on his own. The story is told from Frank’s perspective as an adult decades later. I was worried that the story would be “preachy,” considering that one of the main characters is a minister. There is some talk about God, but Krueger definitely wasn’t heavy-handed. The balance was actually quite nice, since the characters actually do quite a bit of struggling with their faith throughout the course of the novel. I was sucked into the story from the first chapter. Krueger’s language is beautiful, the story was evenly paced, and the characters and their conflicts were well developed. I actually hugged the book when I finished it, sad that it all had to come to an end. I haven’t done that since Harry Potter. This is the book I’ve been recommending everyone in my life to read. Now I’m recommending it to you. 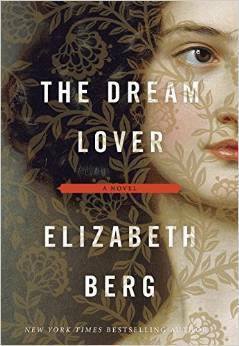 Up this week: The Dream Lover: A Novel of George Sand by Elizabeth Berg. I received an uncorrected proof of this book through the publisher. I am not being compensated in any way for this review. All of the opinions expressed here are my own. I was hoping that this time around, I’d fall in love with the book I was reviewing. The Dream Lover, a novel based on the scandalous life of the 19th century writer George Sand, seemed promising. Even better was the idea that I would be reading a novel based on an actual person. I’d read the book Frog Music by Emma Donohue recently and really loved it, and that was a novel based on a person too. The story started out interesting enough, with Amantine-Lucile-Aurore Dupin leaving her husband and children behind to pursue a life of literature in Paris with her writer lover. She adopts the pseudonym “George” to publish her first novel, which brings her instant fame. Berg uses beautiful, poetic lines and quote-worthy phrases that immerse readers into the feeling that Berg is trying to evoke. I teared up when a character in the book died because the scene was so vivid and well written. I didn’t finish the book though. Frankly, I got pretty bored. Each chapter switched back and forth between the past and present, which left me disoriented. I might have had an easier time coping with this if I had a paperback copy of the book, but I only had an ebook to work with. It was hard for me to keep track of what was happening during each time period unless I was reading for hours at a time. I also think that the ratio for showing vs. telling was a bit skewed towards telling. I would have liked to have been thrown into the middle of the action instead of being told that the character got this job or left on a trip to visit that person. The telling made the story seem more redundant. This is not the worst book I’ve ever read. I would suggest, however, that those who want to attempt it obtain a hard copy of it in order to make the transitions easier to follow. Quitting on a Bad Book? Is it ever okay to give up on a book? I ask because lately, it seems like I can’t find a book that I want to actually finish reading. Besides the Percy Jackson series, I mean. I’m flying through those with an eagerness that I’ve been missing for a long time. Maybe I’m just becoming a snobby curmudgeon as I age. But seriously, I’m in the middle of 9 books right now and don’t have the desire to pick up and finish any of them. Some of these are books on bestselling lists and titles that many of my bookish friends are raving about. The others are galley copies of books that also received a lot of hype. They range from YA novels to literary fiction to nonfiction. Great writing is tough, I get it. It’s why I don’t have a novel of my own on the bookstore shelves yet. I applaud each and every author for their efforts and would have to be a complete idiot to say I could do better. Is it just that the wrong books are finding me? Do I need to go through a phase where I pull back from modern fiction and only read the classics? Should I stick only to the authors I trust for awhile? Do I need to struggle through the story no matter what? I hated Girl with the Dragon Tattoo when I first started reading. I had to get 200 pages deep before the story captivated me. All of the writing advice I’ve ever received said to start out strong and fast paced. Is this the exception, or the rule? I realize this is mostly rambling and that I’ll still probably read whatever book is thrown at me, but still. It’s frustrating. Am I an awful human being for giving up, possibly too quickly, or do I need to whip out the “life is too short” cliche? I love my local library. This past Summer, I spent every Friday afternoon there slowly browsing the shelves. I would check out a stack of books each visit and have them all read in time for the following week’s trip. Then I had to join the real world, and my weekly library visits (and my free time) disappeared completely. I took to downloading audiobooks from my library’s digital collection so that I could “read” while cleaning and cooking or doing other mindless tasks. For the most part, audiobooks have been nothing but a positive experience. I’m so happy that I listened to Ruth Ozeki’s A Tale for the Time Being and Donna Tartt’s The Goldfinch on audiobook, because hearing the different voices, fluent foreign languages, and accents really brought the stories to life. David Sedaris has become my trusted companion on long car rides. The most recent audiobook I’ve listened to is Frog Music by Emma Donoghue, and it was almost a book that I was going to call it quits on. I was bored, confused, and frustrated with how slow the narrator was reading. Its only saving grace was the fact that I had some free time this past weekend to make a much desired trip to the library, and that the colorful hardcover spine of the book jumped out at me from its shelf. I decided to give it one more shot. I began reading the paper version of the book from the place I left off in the audiobook. I’m glad that I gave the book a second chance, because I found the story to be much more enthralling in print. I finished the story in two days because I searched for every opportunity to read it, whereas it had taken almost two months to get through the first 3 hours of the audiobook. I thought initially that the audio version confused me because I was too distracted while listening. With the print version in hand, I realized I was confused because the audio gave no indication of flashbacks. In print, the jumps in time are clearly marked, which made transitions seamless. While it seems standard these days that every printed book eventually receives an audio version, I think this does a disservice to some books. Certain things are lost when you don’t have the text in front of you, especially in the case where time is manipulated. I wonder how many people have given up on a book because the audiobook ruined the story for them?